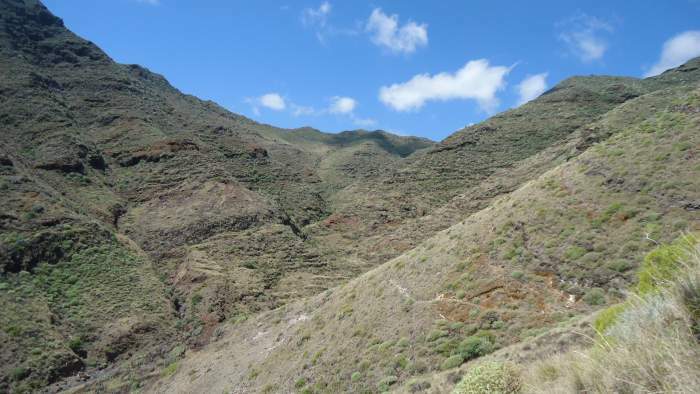 Here is my short description of the Igueste de San Andres – Playa Antequera Tour, from my Tenerife hiking collection. 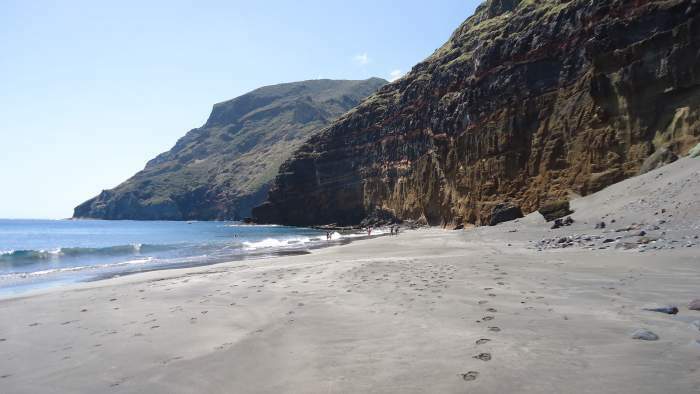 This is a whole day tour in a remote part of the island without any access roads, so you will enjoy the nature of the island. First view of Playa Antequera from the hill above Igueste de San Andres. 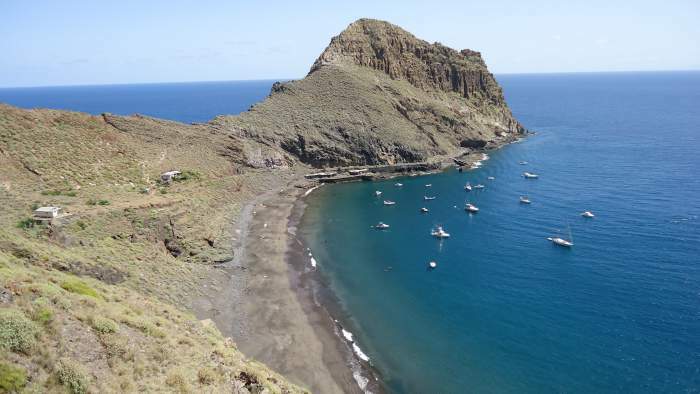 Igueste de San Andres is a remote village on the east-southeast side of the island, but with a good bus connection so getting there from Santa Cruz is easy. Take the bus 945 and enjoy scenic views along the south-east coast. Alternatively, use the car and park anywhere in the village. I am writing this a few years after I did the tour, so I forgot some details, but here below are some photos which will help both you and me. 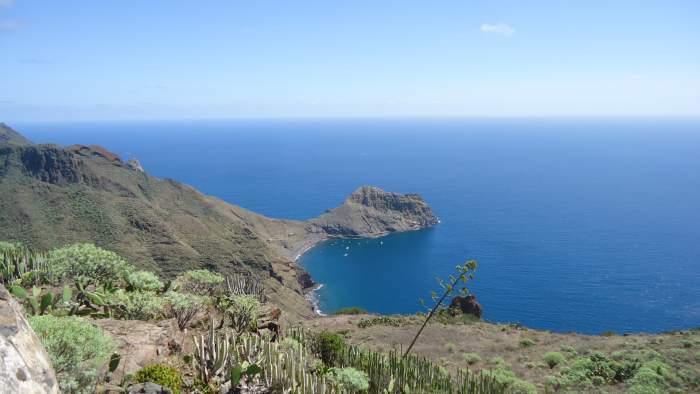 At the beginning of the route above Igueste de San Andres. The scenic road towards Santa Cruz is far behind. This is a circular tour but you can make it differently, just go to Antequera and back if you prefer so. 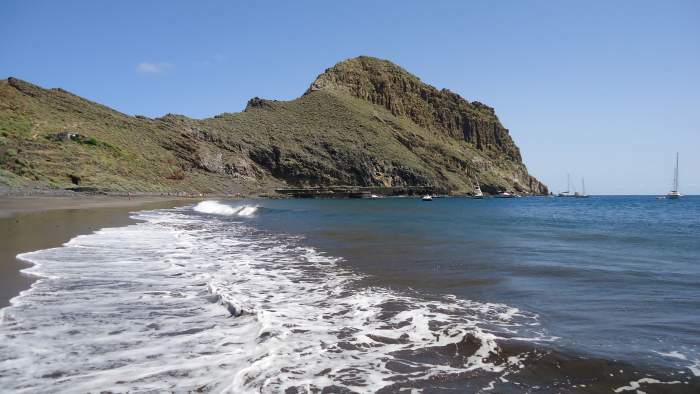 Enjoying the Antequera beach is optional, dependent on the season. I was there in September, the period when the sea water is the best for swimming, so I stayed there for a couple of hours. 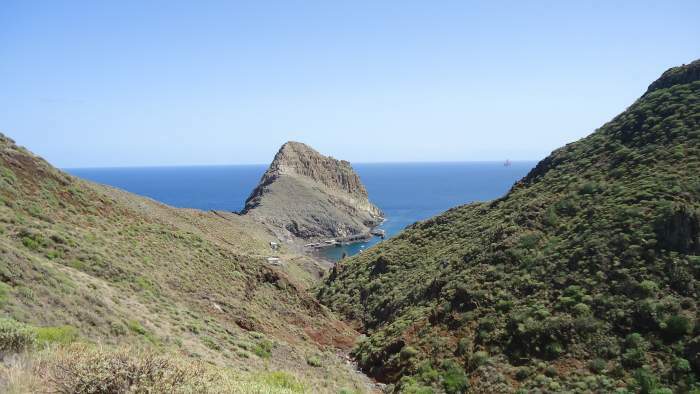 The area behind the Antequera beach is a protected Ijuana zone which I described in my separate text. So this is an empty quarter all the way to Chamorga. Here is the Wikiloc map and the route I passed is marked. The indicated timing is probably correct, perhaps you can do it faster but better not doing so. This is an area of exceptional beauties so why rushing, better enjoy the day and make it a long whole day tour. If you come by bus, go to the last stop and then continue walking between the houses in the east direction and follow the signs for Faro. 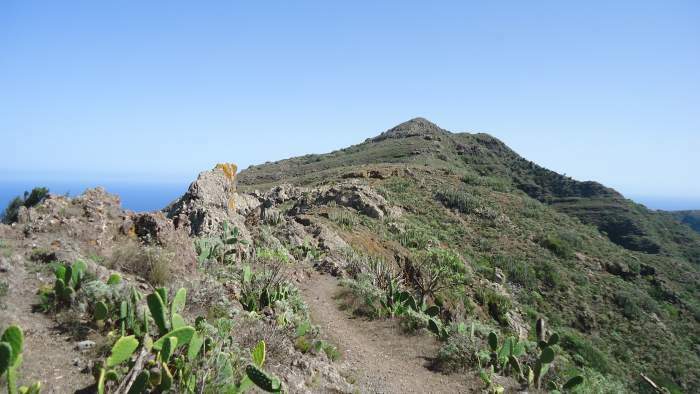 But do not continue to the faro (lighthouse), rather turn up the hill, there is a wide path and in some 30-40 minutes you will be on the top of the hill and Igueste will be below you in the west direction. 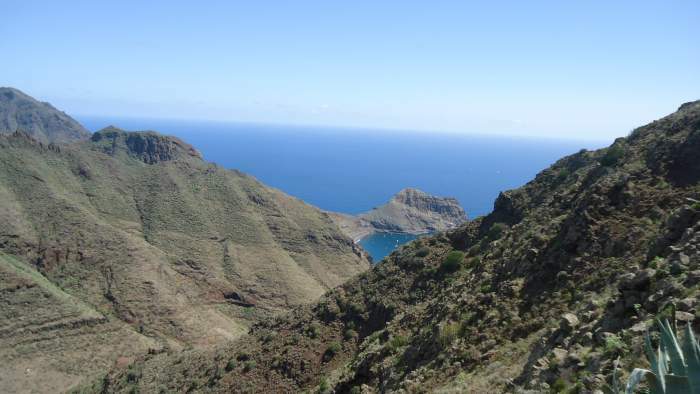 From here you will have breathtaking views and the big part of the road towards Santa Cruz will be visible. You have seen a couple of photos above, they are taken from the spot. The elevation here is around 420 meters above the sea. 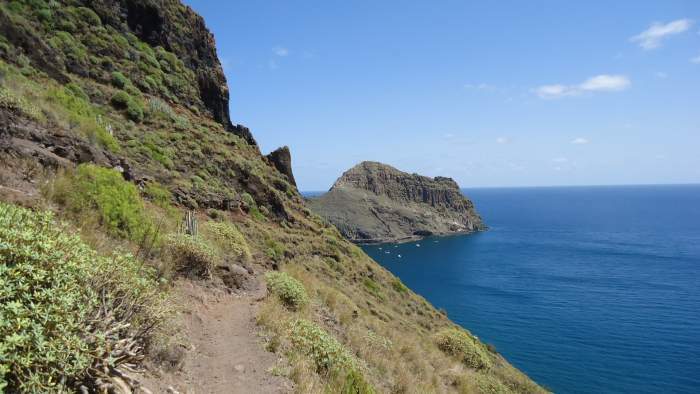 Now you start descending into a gorge on the east side of the hill, there is a very tiny path which you should follow; it goes in the north direction opposite to the sea. The photo below shows what you will see. When you get to its lowest part, the path turns towards the sea and now it is more visible and wider. Descending the hill and Antequera in the distance on the right. I did not check the time so have no idea how much time is needed to get to the beach, the weather was just perfect, so I did not care about the timing. But it probably took me 90 minutes or so. There was nobody on the route, and there were only a few people on the beach in the distance, but this is a large area so I had a big part of the beach for myself. I took a long rest here. Can you imagine why? After the beach, I continued along another gorge (Barranco de Antequera) which goes in the north-west direction, see the picture below. So this is now harder because you will be gaining the altitude up to the point which is 520 meters above the sea (this according to my Casio watch which was showing me the elevation). The Wikiloc map shows nearly the same. The highest point is shown in the picture below. Continuing along Barranco de Antequera, the second part of the tour. 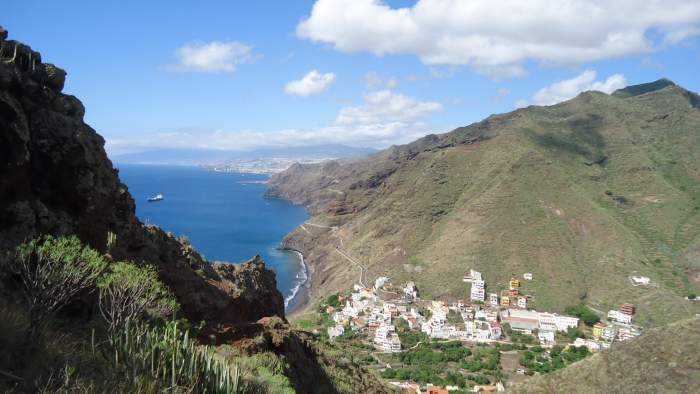 At this highest point, Las Casillas houses are close above you, but you will turn to the south and start descending to Barranco de Igueste and towards the village. This is still a long way to go, so if you are with kids they might find it very annoying. I have had such experiences with kids, but this was decades ago and in some other country. You will have to carry water for you, it is not available on the route. The same is about food. As far as I know, there are no shops or restaurants in Igueste or anywhere close to it. As for the equipment, have some sun hut, glasses, I have used trekking poles as usual. Any hiking shoes or boots will be good enough, this is a walking tour, the path is always visible. Any day-hiking backpack will be fine, I had my old Deuter Futura. Thank you for reading, please let me know if you are familiar with this area, and share your experience with us. There is a comment box below, so use it for that purpose or if you have any question. Have a nice day.